Everyone knows Charles Dickens’ story of “A Christmas Carol”: of the grouchy old Ebenezer Scrooge who dismisses Christmas greetings with “Bah, Humbug!,” his clerk Bob Cratchit, Bob's cheerful, crippled son Tiny Tim, the Spirits of Christmas Past, Present and Future. This is a good time to reread the story, even though it isn’t Christmas, because it is remarkably pertinent not only to the season of Christmas but to our contemporary climate. Charles Dickens was not just a celebrated author, but also a social reformer, deeply concerned with the harsh plight of the poor. He lived in 19th century Victorian England that had just become an industrial and military superpower. Towns and cities had seemingly mushroomed overnight. Masses of the poor had migrated from the sweet countryside to work in grimy factories, smoky mills and perilous coal mines. An economic miracle it was! But this new economic success came at a cost. In London, extreme poverty co-existed side by side with great affluence and opulence. Thus, using Scrooge as an anti-hero of sorts, Dickens wished to indict his society, a society that had grown indifferent to the plight of the poor. Like many of the rich, Scrooge felt that he owed nothing to anyone lower in monetary status than himself. To him, if people are poor, that means they are stupid, lazy, stubborn and richly deserve their punishing poverty. He complained about how the State had unjustly taxed him to support the prisons and workhouses which served to benefit persons who did not deserve them. To Scrooge, the poor are worthless, burdensome and deserve to die. At least in their death, they would help to decrease the surplus population. 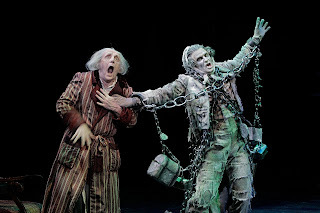 As the story reaches its climatic conclusion, Scrooge would discover that the salvation of his mortal soul depended not on his wealth or hard work, but on how he dealt with his fellow men. He realised that the sum total of his life amounted to zero. He will surely die unloved and unnoticed, unless he chooses a different course of living from that moment on. In today’s gospel parable, we meet the ignoble character of the ‘rich man.’ Tradition names him as ‘Dives,’ which in Latin means exactly that, ‘rich man.’ There is a bit of irony in this: Lazarus is recognised by God, both in this life and the next; and he has a name. Dives, on the other hand, has no name. His identity is an abstraction of his wealth but this is unrecognised by God. Laid outside the gate of this rich man’s house, however, was an extremely poor man named Lazarus, who expected no more than to feed from the scraps that fell off the table of the rich man. The rich man was completely indifferent to the plight of Lazarus. Eventually, they both died. Lazarus went to heaven, and Dives to hell. At the end of the story, the rich man asked Abraham to send Lazarus back to earth to warn his brothers to repent so that they would never join him in hell. Abraham told the rich man that if his brothers did not believe in Scripture, neither would they believe in a messenger, even if he came straight from heaven. Man’s indifference to his neighbour is finally unmasked – it is merely a cover, a symptom of man’s indifference to God. The parable is troubling because Dives was not a horrible person. He’s nothing like the cold, calculative and miserly Scrooge. In fact, the gospel never states that Dives mistreated Lazarus. There is no mention of him acquiring his wealth through unjust means. Then what did he do that was so horrible that he should deserve such a terrible fate. It was simply his apathy: he was enclosed in his safe little world of personal enjoyment. The irony in this story is accentuated by the mention of dogs – dumb animals seem to show greater concern and compassion than this man who wines and dines, blind to the presence of the beggar who sits at his gate. The dogs displayed greater solidarity than a fellow human being. To the rich man, Lazarus was just a part of the landscape. They both were merely neighbours who never met. The indifference which blinded Dives to the needs of Lazarus and others in this life is a foretaste of what is to come - the chasm that separates heaven from hell, a chasm wide and unbridgeable. There is no passing between the two, ever. In life, a big chasm had opened up between Dives and Lazarus due to the former’s apathy. Lazarus never showed up on Dives’ radar. In death, this chasm has grown infinite. The chasm which Dives maintained through his indifference in life, had ultimately set him apart from God in death. Now, it is the rich man's turn to be dropped off God’s radar. Indifference does not only spell human tragedy, it also means the lost salvation. Experience teaches us that this world is broken and our desires cannot be satisfied within the walls of the world. But God who lives beyond the walls of the world is living and working within it, in order to save it from brokenness caused by man. Man may be indifferent, but God isn’t. Even now He is here, loving our world and hating the sin which had disfigured it, and constantly working to redeem it. Unlike the rich man, God sees our wounded-ness and our spiritual poverty, and God acts. If indifference blinds and petrifies us into inaction, Love sees and Love acts. God is never indifferent. He sees, He acts, He heals, He pardons and He saves.